This book intrigued me from the very beginning and left me in a state of intrigue after I was finished. 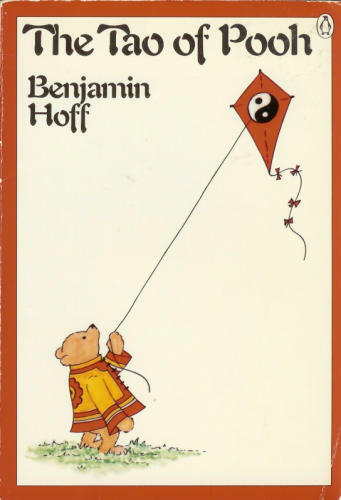 Benjamin Hoff, author and Taoist, is also a genius. He combines the principles of Taoism, making this book a guide on how to live a Taoist life, with the original stories of Winnie-the-Pooh and his own narrative with Winnie-the-Pooh. Hoff presents, outlines, explains, and gives examples of the various aspects of Taoism and tells the reader how to live a Taoist lifestyle. He tells of his own discussions with Winnie-the-Pooh (fictional obviously) on Taoism while explaining the principle. He uses stories from Taoist masters and many excerpts from Winnie-the-Pooh stories to further explain and illustrate how the reader can live a Taoist lifestyle. Benjamin Hoff gives just the right amount of all three elements to make this book a life-changing read for all ages. The Taoist principles are explained in such a way that the whole book is based on the principles that it teaches. At only about 150 pages, the book is a very short read that is a definite must for people of all religions and backgrounds. I finished reading this book and tried to find ways to simplify my life. The basis of this book is the idea of basics. The back cover says this: While Eeyore Frets...and Piglet hesitates...and Rabbit calculates...and Owl pontificates...Pooh just is. The book explains how Pooh Bear just does things because he finds something good or useful about the moment. He doesn't have very much Brain and doesn't plan or calculate or worry or hesitate. He just does things and lets things happen naturally. That is the reason this book is so intriguing. I would recommend this book to anyone who wants to have a more fulfilling, less stressful life. Although it may seem so simple, ... well, that's because it is so simple. At the end of the book Hoff shows that the real answer to making your life work out is ... Nothing. Just let things happen naturally. Read the book and you will discover the secret of nothing. I will definitely keep this book and read it over and over again. I've always seen this book and had NO idea what it was about! I am definitely in need of simplifying my life! I know this is categorized in Humor at B&N... from this review, though, it doesn't sound like it is. What do you think, Nathan? Or anyone for that matter. I've been curious about this book for a while, so I'm glad to hear that it's good and worth a read! I think he wrote another one about Piglet, but I don't remember what it was called. Jessi: The Te of Piglet :) I want to read that one too. I've heard such a lot of things about this book, most of them good. Thanks for your views on it. I've heard nothing but great things about this book. Thanks for the review. I'm going to add this to my TBR list.